Light Weight Billet Wheel With More And Larger Blades. Quicker Spool Time Gives Upto 10% More Power. Heavy Duty Heat Shield Heavy Duty Bearings. 360 Digree Thrust Bearing 25% Larger then OE. Balanced to Finer Tolorances Than OE So It Lasts Longer. FITS TO VEHICLE VAUXHALL SAAB. MODELS VECTRA ZAFIRA ASTRA SIGNUM 9.3. We Have Over 30 years Of Experience in Remanufacturing Industry. Our Quality Assurance Process , and Confidence In Our Part Suppliers, ensure We Supply The Best Quality Turbochargers To the Motor Trade and Individual Motorist. We Also Provide A Professional Fitting Service In BIRMINGHAM And the Surrounding Areas. Each Turbocharger is completely disassembled. The internal parts are discarded, irrespective of wear. The external housings are passed through a five stage cleaning process , with an additional ultrasonic clean. We then build a brand new CHRA or core housing rotor assembly using OEM quality parts. This is balanced before insertion into the turbocharger. Each turbo core is build with OE quality matching parts which include brand new bearings, seal plates, oil seals, turbine shaft, compressor wheel, thrust plates, piston rings and then balanced up to 250,000 revolutions. We replace the VNT then the turbo is re-assembled. We then fit the actuator and test the completed turbo for functionality. We use 2 types Of Balancing Machines to Balance Our Core Assamblies. Both are state of art and industry leading. One is UK Made TURBO-TECHINCS VSR Machine. And The Other Is CMAT VSR Balancing Machine. We Use A Latest and Profasional ATD Machine to ReCalibrate and Reprogramme Electronic Actuators on Both Hella And Mitsubhishi Turbochargers and Use REDAT Machine for Vacuum Actuators. Electronic Actuators are Fully Re-Manufactured and new motor and gears are fitted then tested with an ATD-1 Eqipment. 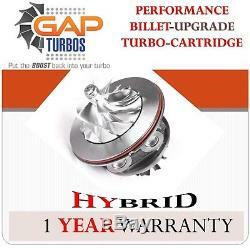 HYBRID - BILLET UPGRADE TURBOCHARGER CARTRIDGE WHY CHOOSE BILLET HYBRID Light Weight Billet Wheel With More And Larger Blades Quicker Spool Time Gives Upto 10% More Power Heavy Duty Heat Shield Heavy Duty Bearings 360 Digree Thrust Bearing 25% Larger then OE ​​​​​​​ Balanced to Finer Tolorances Then OE So It Lasts Longer Cast wheel Billet Wheel FITS TO VEHICLE VAUXHALL , SAAB ENGINE 1.9 CDTI ENGINE CODE Z19DTH TURBO PART NO 755046 MODEL VECTRA ZAFIRA ASTRA SIGNUM 9-3 TURBO MAKE. GARETT POWER 110 KW WHY CHOOSE US. OUR PROCESS We Have Over 30 years Of Experience in Remanufacturing Industry. We Also Provide A Proffesional Fitting Service In BIRMINGHAM And the Surrounding Areas. The external housings are passed through a five stage cleaning process, with an additional ultrasonic clean. TURBO TECHNIC VSR ​​​​​​​VIBRATION SORTING RIG Actuator Equipment We Use A Latest and Profasional ATD Machine to ReCalibrate and Reprogramme Electronic Actuators on Both Hella And Mitsubhishi Turbochargers and Use REDAT Machine for Vacume Actuators. Electronic Actuators Electronic Actuators are Fully Re-Manufactured and new motor and gears are fitted then tested with an ATD-1 Eqipment. Balanced to Finer Tolorances Then OE So It Lasts Longer. FITS TO VEHICLE VAUXHALL , SAAB. MODEL VECTRA ZAFIRA ASTRA SIGNUM 9-3. We Use A Latest and Profasional ATD Machine to ReCalibrate and Reprogramme Electronic Actuators on Both Hella And Mitsubhishi Turbochargers and Use REDAT Machine for Vacume Actuators. The item "HYBRID CORE Vauxhall VECTRA 1.9 CDTI 150HP BILLET UPGRADE 755046 Turbo CARTRIDGE" is in sale since Thursday, May 24, 2018. This item is in the category "Vehicle Parts & Accessories\Car Parts\Turbos & Superchargers\Turbochargers & Parts". The seller is "sukiglobal" and is located in birmingham, West Midlands. This item can be shipped to United Kingdom.